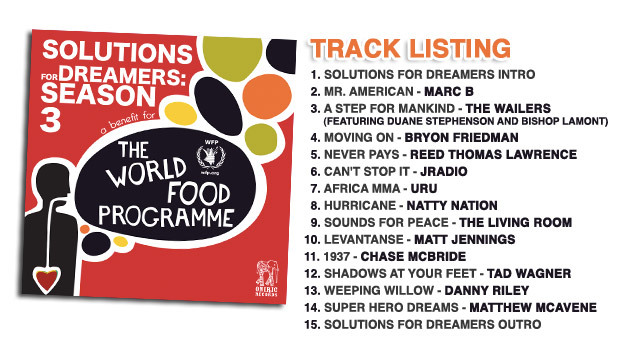 SoundRoots World Music & Global Culture: Monday's mp3: Can You Go Hungry for Just One Day? Monday's mp3: Can You Go Hungry for Just One Day? Buying a CD won't solve global hunger. But buying this one will help. This 15-track compilation includes tracks from a variety of artists -- including Natty Nation, The Wailers, Tad Wagner, and Reed Thomas Lawrence -- in a variety of styles from blues and reggae to indie and Latin rock. Interspersed with the tunes are helpful little announcements about how to make an improvement in the world food situation. This is an odd one for SoundRoots, since few of the tracks fall squarely into the "world music" category. Yet the cause behind this album and the general like-ability of the songs (even, grudgingly, The Wailers' anthem-esque "A Step for Mankind") makes it a worthy buy.